2. Zum Beispiel: Gaspar Correa <16. Jhdt.>: Lendas de India, dritte Reise Vasco da Gamas nach Indien. Correa, Gaspar <16. Jhdt>: The three voyages of Vasco da Gama, and his viceroyalty. From the Lendas de India of Gaspar Correa. Accompanied by original documents / Translated from the Portuguese, with notes and an introd., by Henry E. J. Stanley. -- New York : Franklin, [1963?]. -- lxxx, 430, xxxv S. ; 23 cm. -- Reprint of the 1869 ed. published by the Hakluyt Society. -- (Hakluyt Society. Works ; no. 42.). -- Originaltitel: Lendas de India. -- S. 380 - 430. -- Online: http://www.archive.org/details/voyageroundworld01tayl. -- Zugriff am 2008-05-22. -- "Not in copyright." Dom Vasco da Gama, second Viceroy of India, who went thither this year—1524. On the eleventh of September1 there arrived at the bar of Goa, Dom Vasco da Gama, who discovered India, as viceroy of India ; he had been made Count of Vidigueira, and admiral of the Indian seas, and he came this year in the ship St. Catherine of Mount Sinay, and with him there came two sons ; the elder named Dom Estevan da Gama, who was captain-major at sea, and later was governor of India ; and the other named Dom Paulo da Gama, who was killed in the war of Malacca. The said Dom Vasco brought with him great state, and was served by men bearing silver maces, by a major-domo, and two pages with gold neck-chains, many equerries, and body servants, very well clothed and cared for ; he also brought rich vessels of silver, and rich tapestry of Flanders, and for the table at which he sate, brocade cloths. They brought to him at table large dishes, as if to the king, with his napkin-bearer bringing him the ewer, and all the forms of precedence of a king. The ornaments of his wardrobe, bed, and chapel were very [S. 381] complete, with much show and arrangement. He had a guard of two hundred men, with gilt pikes, clothed with his livery. He kept a splendid table; all the gentlemen and honourable persons ate with him. He brought out with him complete power of justice and revenue, like the King's self, over all persons who might be found beyond the Cape of Good Hope. He was a very disdainful man, and ready to anger, very rash, much feared and respected, very knowing and experienced in all matters. He brought with him very brilliant soldiery, and as captains, men of high family, the greater part of whom had been brought up in the labours of Indian affairs ; also Afonso Mexia, clerk of the King's chamber, as overseer of the treasury, and as secretary, Vicento Pegado, a noble gentleman, who in the office spoke to him with one knee on the ground. He brought out large supplies for the magazines, and much artillery, and armouries of white weapons, rich cuirasses and firelocks, which were given to the people in his pay, as was the custom in the kingdom.2 There came with him Dom Anrique de Meneses, as captain of Goa, who later was governor of India, aud Lopo Vaz da Sampayo, as captain of Cochym, who also was governor in India ; and Pero Mascarenhas as captain of Malacca, who also governed India, as will be seen in this history, in their times. And there came Antonio da Silveira, D. Fernando de Monroyo, and D. Simão de Meneses, who was to be captain at Cananor, and Vicente Gil, a shipping agent, and the overseer of the revenue, and Antonio Carvalho, his clerk, in small ships, and Francisco de Brito for the voyage to Ormuz; and Ruy Gonzalvez, who was captain of the militia in India, Lopo Lobo, Christovão Rosado, Mosem Gaspar Homem, a foreigner, these four were in lateen-rigged carvels ; and Pero Velho in a round carvel. Dom Fernando de Monroyo was wrecked on the [S. 382] coast of Melinde, which I will relate further on ; the Mosem Gaspar, being a man of narrow understanding, and not conducting himself well with the people, the seamen, and master and pilot killed him,3 and seized upon the carvel and went to the Strait to cruise for prizes, where they were captured by Antonio da Miranda, who went there with a fleet, and brought them to India, where all were hung. The viceroy arrived at Mozambique,3 where he provided what was necessary, and from thence he sent one of his servants in the carvel of Mosem Gaspar with a present of various things of the kingdom, which he sent to the King of Melinde, with letters of great friendship, and asking pardon for not going to visit him in person, as he had a large fleet to lade, and time was wanting. In this voyage, on leaving Melinde for India, the mice Gaspar was killed. 1 The original MS. has—Em xi de Setembro chegou, etc. ; it is possible that an x was omitted. Castanheda says Gama left Portugal on the 9th of April, 1524. 2 Barros says the fleet carried three thousand men, a great part of whom were gentlemen, knights, and dependents of the King's palace. 3 Barros says Gama's fleet was composed of nine large ships and five lateen carvels, which sailed from Lisbon on the 9th April, 1524. Besides the captains mentioned by Correa, he names D. Jorge de Meneses and Francisco de Sa, son of João Rodrigues do Sá, alcaide mór of Oporto, who was to go to Java to erect a fort at Sunda. Barros says that Mosem Gaspar was a Majorcan : he mentions the loss of the ship of Francisco de Brito, of the galloon of D. Francisco de Monroy on the shoals of Melinde, whose crew were saved, and the loss of the carvels of Christovão Rosado and Mosem Gaspar. Castanheda also says Gama sailed on the 9th April with fourteen sail, of which seven were ships, four caravels, and three galleons. 4 Barros says the fleet arrived at Mozambique on the 14th of August, and that Gama there repaired a yardarm which had been sprung in his own ship. The Viceroy with the fleet reached the coast of India in the neighbourhood of Dabul [Dabhal]; and before they saw land, and with the wind becalmed, during the watch of daybreak, the sea trembled in such manner, giving such great buffets to the ships, that all thought they were on shoals, and struck the sails, and lowered the boats into the sea with great shouts and cries, and discharge of cannons. On casting the lead, with the perturbation, they did not find any bottom, [S. 383] and they cried to God for mercy, because the ships pitched so violently that the men could not stand upright, and the chests were sent from one end of the ship to the other. This trembling came on with violence, and died off, and then again was renewed, each time during the space of a Credo, The whole lasted for about an hour, in which the water made a great boiling up, one sea struggling with another. There came with the Viceroy a master of the art of medicine, an astrologer, who at once said to the Viceroy that it was a quaking of the sea.1 When it was clear day they saw the [S. 384] land, and when it was recognised, with the sea-breeze they stood for Chaul, where they anchored, and Simão d'Andrade at once went to visit the ship. The Viceroy did him great honour, and gave to him and to all the captains of the fleet large presents of refreshments, because he was very grand [S. 385] and liberal in his expenditure. There the Viceroy at once appointed Christovão de Sousa as captain of the fortress, according to instruction from the King. The Viceroy also made appointments in all posts, high and low, because he had instructions to make appointments for everything wherever he arrived, without waiting for the governor, Dom Duarte [de Meneses] , to give him his accounts, since the King was very indignant with him for his evil deeds. The Viceroy gave a written instruction to Christovão de Sousa, that if the governor should come thither, he should do nothing that he might command him, and not to fulfil anything of what he might find to have been commanded by him. Having disposed of matters as was fitting in Chaul, he went to Goa,3 where the city gave him a great reception [S. 386] with festivities and a rich canopy, and a harangue, and they bore him in procession to the cathedral ; and they conveyed [S. 387] him with rejoicings to the fortress, which Francisco Pereira had kept in very good order, and he had gone to visit the viceroy [S. 388] at the bar, and accompanied him. The viceroy, on entering the fortress, said to him : "Senhor Francisco Pereira, I [S. 389] should wish to find all your affairs kept thus in as good order as these buildings." Because he brought a memorandum [S. 390] against him of grave accusations which had reached the King concerning him. Immediately, on the next day, he put Dom Anrique de Meneses in the captaincy, and the people of the country seeing that Francisco Pereira was already turned out of the post of captain, there came at once to the viceroy great complaints of great evil doings, which the viceroy already brought written down ; on which account the viceroy heard a great deal against him, for he had instructions to observe strict justice in all matters.4 He made Francisco Pereira pay much money, without demands nor citations, because he heard the parties verbally, and he condemned him to pay, for he already knew the evil deeds done by Francisco Pereira, which had been reported to the kingdom by certified inquiries. For he was so bold a man, and conducted himself so ill with the people, that the chief men of the city had been near rising up and deposing him from the post of captain, and for that reason they concerted and drew up a statement with many counts to be given to [S. 391] the governor, and to be sent to the King witli the legal representative of the city to pray for justice ; in this were stated many very shameful things, worthy of severe chastisement. This business was concerted by eighteen householders, chief men of Goa, and witnesses were named, This minute, thus drawn up, was shewn to the bishop, Dom Martinho, who was in Goa, and was lying ill in bed when the viceroy arrived, and on that account did not go to receive him with the procession ; he, on seeing the statement, saw that it was all true ; and they wished to elect the bishop as captain until the governor should come, but the bishop was virtuous, and would not consent to it, but, on the contrary, turned them aside from the whole matter. Since doubt arose amongst them that this might be discovered, all of their free will took oath upon a missal book in the hands of the bishop, never to discover this matter, and that all of them would kill whoever disclosed it. Here there is an error in the dates, and Barros contradicts himself, for he says the earthquake happened on the 7th September, after which there were eight days' navigation, which would bring the fleet to Chaul on the 15th September : the date of the fifth can hardly be a misprint for the fifteenth, since Barros says Gama left Chaul on the 12th. San Roman says the earthquake happened on the morning of the sixth September. Castanheda mentions the earthquake on the 6th September, near the coast of India. 2 Barros says that in Chaul, Vasco da Gama took the title of Viceroy as he had been ordered by the King to take it in the first fortress of India which he reached : in which the King followed the example of his father D. Manuel when he sent Francisco d'Almeida to those parts. Castanheda says that Gama published his commission in Chaul, as the King had ordered, and that he remained there three days at anchor without landing, nor allowing any one to land, except Joan Soyro, the auditor-general, and Sebastian Luis, the secretary of Cochym, whom he ordered to visit, in his name, the fortress of Chaul, and to publish that all the soldiers who were unmarried or who did not belong to the local garrison were to embark at once and follow the Viceroy. He also ordered Christopher de Sousa, the captain of the fort, that if Duarte de Meneses arrived he was not to allow him to land, nor give him provisions for more than four days. 3 The following is a translation of a letter from the Chamber of Goa announcing the arrival of Vasco da Gama at Goa on the 23rd September, 1524, the text of which is given in the Appendix, p. x. "Through Luis Fernandez Colazo, whom we had sent as our agent to Your Highness, we received the answer to the letters which he conveyed from this city, and also the confirmation of our privileges, with the settlement of regulations, and also the sanction of appointments to offices, all despatched satisfactorily as we desired, and for all this we kiss the hands of Your Highness ; and we cannot deny that the love and good will which the King your father (may he be in holy glory !) had for this city and its inhabitants is not forgotten, according as we see by the many favours which you grant us, both in despatching our business, and in all the rest which for our part we have requested : and for ever we and our sons will beseech and pray the Lord God to increase the days and royal state of Your Highness for His service. "The Count of Vidigueira arrived at this city on the 23rd day of September of the present year with nine ships; they say that five are wanting of the number of those that set sail with him. It seems to us that he comes with good designs, and desirous to serve Your Highness, and to do justice to suitors, which is very requisite for this country; from what we have seen in this city, and from what he did in the few days that he remained in it in redressing the injuries of many persons, and rectifying faults which had been committed against your revenue. He was received by us in this city with that honour which those deserve who love justice, and fulfil your commands. We presented to him our privileges and liberties, to all which he says he will have regard as they have been granted us by Your Highness ; on account of the short time that he remained in this city, he could not despatch some matters which we brought before him, and because the time drew nigh for getting ready the pepper cargo, neither would he take cognisance of many matters which remain until his return, and according as things happen here, it is not fitting for him to repose in the midst of what he is charged with, as we have seen. "Many persons went to him with offerings such as it is customary to make to governors when they are newly arrived; he would not take anything from Christian or Moor, and still less from this city, which we all look upon as extraordinary, as it is the custom for all to be accepted. He left as captain in this city Dom Anrique de Meneses, as D. Fernando had not come, who it is said is coming as captain : we cannot say anything besides what should be said of a good gentleman, and we are treated by him as is reasonable and just, and according to what Your Highness commands and recommends. "In all the letters which we have written to Your Highness we have given an account of this city and of its noble foundation, and of the Portuguese inhabitants who dwell in it with their wives and children, and now it seems right that we should do so in this letter. 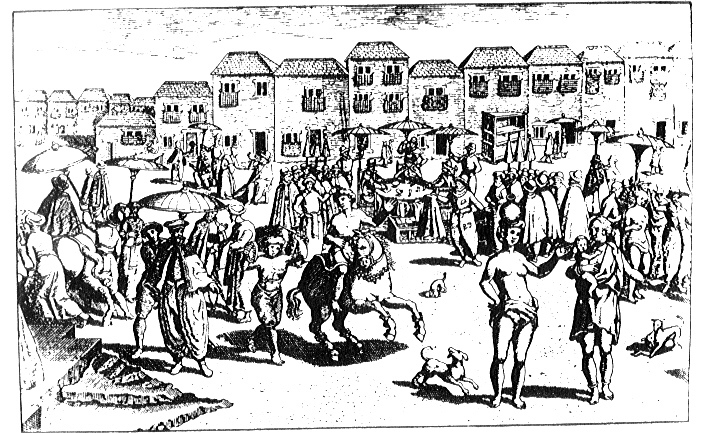 It scorns that the Portuguese who at present are married and established will be four hundred and fifty, and it cannot with certainty be said how many they are, as they are scattered about in many parts, and of those we know of many are gentlemen, and knights, and squires, servants of yours, and other persons of much desert, who have rendered much service to Your Highness, both in these parts and in others of your realms ; these have got sons and daughters to marry, and some of them already married in this city : and since it is thus ordained by God that we are to leave our native countries to people this land, we beg Your Highness to bear in mind our services, and those which it is hoped that our sons will perform. "With regard to some works which have been executed in this city, the chief one is the monastery of St. Francis, which we may say has been completed, and it is said to be one of the best houses to be found in your realms, both for its good monks, and for its other works; and in the next place a hospital which Francisco Pereira built close to the gate of St. Catharine of this city, and excepting that of Lisbon we know of no other better, it is a great comfort to the sick, with the good management which it has ; and it was very necessary that it should have been built, on account of the many sick who arrived with this fleet of the Count. "There has also been made a stone quay on the sea at the strand-gate, and this was by the orders of Francisco Pereira ; it is a great embellishment of the city, as it is a very good work, and galleys, and fuatas, and other small vessels come alongside of it to discharge cargo, and take in what they want : there are some other works which are not more near completion than they were before, and the others which Francisco Pereira executed during the time that he was captain here, Your Highness will already know of. "We reminded the Count of the repairs of the walls of this city ; he took much pleasure at this, and looked to it, and ordered D. Anrique our captain to commence facing it, we beg Your Highness to give further orders to undertake this and make the necessary repairs, because it is not for your service that it should remain thus. "With regard to the building of the houses which the inhabitants have made, they are good, and every day they build some, and within the circuit of the city there is no inoccupied ground, nor can the married people be contained within it, and many live outside in the suburbs, being unable to do anything else, as they are very poor. "The mainland which Ruy de Melo, who was captain of this city, conquered, was entered by the Moors, who used to possess it, in the month of April of five hundred and twenty-four, and they hold it as theirs, and the first Tanadar's district which they took was that of Perna, which is by the seaside : there they captured two Portuguese, and one of them was the Tanadar ; these are prisoners in the fortress of Bylgan, of which the Suffilarim is captain. We do not judge to whom should be given the blame for losing this land, but Dom Duarte, who was the governor in these parts, was at the bar of this city with a fleet ready to sail for Ormuz, and he was asked to give succour, and told that with few men he could cast out the Moors from the country : he answered that he could not do it, as he was on a voyage ; and that even if Goa should be lost, he would not desist from going to Ormuz, which was little necessary for what was fitting for your service. His brother, Dom Luis de Meneses, was also at that time in this city, and he went to winter in Cochym, and he carried away all the men whom he could, and as it was the beginning of winter the Moors increased in numbers and got possession of the country ; nevertheless, Francisco Pereira crossed over the river with what men he had in the city, who were very few, and for all that, he could do nothing more there than abandon the country. "The horses which came this year from Ormuz to this city were one thousand three hundred and forty-three, besides thirty-six that died, and the reason that more did not come was the insurrection which happened in Ormuz this year. It seems to us more will come, on account of the trade of Ormuz having been established with the merchants. "As soon as the Count arrived at this city, among other things which we requested of him, on behalf of the city and its inhabitants, we presented to him some minutes, which were made in the Chamber with the concurrence of all the people: in these we seek redress from him for some disputes and injuries which were done by Francisco Pereira, our captain, to several inhabitants of this city ; and not so much for what touched their persons, as each one could make his complaint for himself, but for what concerned the privileges and liberties which were given us by the King your father (may he be in glory), and now have been newly confirmed by Your Highness ; for [his conduct] was in a great measure in opposition to these, such as putting many of the citizens into prison in irons without reason, and without charge or inquiry held upon them, in which he went against our said privileges, and after that, in ordering their houses to be taken from some of the inhabitants to lodge other persons in them, turning out of them their wives and children, in which he acted against the said privileges ; and this also in ordering all the provisions which came to this city to cross the wharves in order to lade his ships, and again sell them in this city, and in giving offices which Your Highness had granted to us, to single men, as happened with the port of entrance of Manuel de Sampayo, which was vacant. It was also contrary to the said privileges his ordering to put in prison the ordinary judges who by election are appointed with their staves, and he ordered the solicitor of the city to be put into prison in irons for requiring what his office made requisite ; and he took away the staves of some of the inspectors of the markets and had them broken in pieces ; and the fines of the market which were decided by the inspectors of weights and measures, he did not choose that they should be conveyed to the Chamber, by which the city suffered loss. There were other things contained in the said minutes, which we drew up that the Count might see them, and act in this as he thought most fit for your service. These he saw, and being on the way to Cochym, he could not inquire more into this, and he committed all to Dom Anrique, our captain ; and upon the said minutes a process was instituted, and according to its nature great expenses were caused to the people of this city, upon which we held a Chamber, and all the people were summoned by proclamation ; and it was agreed upon by all, that the said minutes had not been given to the Count in order that claims should be made by law, and that men should waste their property [sueing] with Francisco Pereira, but only in order that he, through the powers which he brings from Your Highness, should take measures in this matter according as might be for your service ; and that we should write this same to Your Highness respecting the said minutes, in what concerned the privileges of this city, since we felt aggrieved in what had been done in opposition to them, in what has been said, not only in the special matter, but in general, as is notorious ; and since we saw that the decision of these affairs was postponed, and that Francisco Pereira had cast suspicion upon all the inhabitants of this city, both upon the officers of justice and upon other persons, and that this suspicion gained credence, we desist from saying more of the said minutes, and of the opinion of the people ; and we inform Your Highness of it, and petition you in respect to Francisco Pereira's going against our privileges, to preserve entire justice towards us, and to command that the truth may be ascertained by persons free from suspicion : for it cannot be but that among five hundred inhabitants that are in this city, there should not be twenty, of whom there is no suspicion, and who are not ill disposed to Francisco Pereira ; because we hope to prove completely that he has acted against the said privileges in what has been mentioned, and he gives as an excuse that we did not notify them to him, when the fortress of this city was handed over to him by Rui de Mello. At that time they were read and notified to him by the officers of the Chamber, and he swore upon the Holy Gospels to comply with them, and he signed the oath at the foot of the book of the Chamber, as will be seen. "Your Highness has granted to the inhabitants of this city the favour that the offices both of your treasury and of justice should be held among them for three years, and by those persons who were capable, as is stated more at length in the letter granting the said offices ; and as we see that of these who have to be in office for three years, some persons since your letter hold them for their lives, we are aggrieved in this ; also as Crysua, who holds four offices, and Pero Gdo. three, and in other cases each one has his, which we do not name, we petition Your Highness that no office be granted for life, but only for three years at a time, for there do not remain besides any more than seven or eight offices, and of these we take whatever they give us, up to the present time. So we petition Your Highness to be pleased that of these offices which may have to be provided for by the governor or captain of the fort, the presentation of persons for them may be by the Chamber, so that all may have part in the favour which is granted them by Your Highness, for it happens frequently that the offices are given more from partisanship than from merit. "With respect to some offices which ought to be appointed for life, we have already written upon that matter to Your Highness, as it seems to us to be for the service of God and for yours : such as are the notaries, of deeds, of justice, and of the Chamber, because these are appointments which it is not well that they should run for three years, and not for the lives of the persons who are to serve them ; and the notaries of deeds whom Your Highness sends, let them be given for life, and so it will be done. By the fleets which went from here in the time of Dom Duarte, we have written at length to your Highness many things about this city and also about India, and it seems to us unnecessary to write more in this, since the things which have been done cannot be hid. May it please the Lord God to increase the days and royal state of Your Highness for His service. Written in the Chamber of the said city of Goa on the last day of October. Luis Alvarez did it. Year of 1524. "Christovam Affonso, Diogo Y°, Payo Rodriguez, Tero Gonzalez." 4 Barros says the chief thing the Viceroy did in Goa was to inquire into the affairs of Francisco Pereira Pestana, the captain of the city, against whom there were some complaints, as he was a man of a harsh disposition ; and they were such that he deprived him of his captaincy, and put into it D. Henrique de Meneses. 1 Castanheda relates this, and adds : "By this means Fereira acquitted himself of his debts through the prudence of the Viceroy, who took good care that each man got his rights and nothing more." 2 Francisco Pereira Testana left Lisbon to come out to India in April 1508 as captain of the Lionarda, with the appointment of captain of the fort at Quiloa. (Correa, i, p. 88G ; Osorio, v.) The last time Correa mentions him is in February 1526, when, after the death of the governor Anrique de Meneses, Pero Mascarenhas, captain of Malacca, was found to be the first named in the succession to the governorship ; and those who expected to be the next named were D. Simão de Meneses, Heytor da Silveira, Francisco Pereira Pestana, João da Silveira, and Lopo Vaz de Sampayo. This latter was the one actually named, and he held the government till Pero Mascarenhas arrived. The mention made of Pereira in 1525 by Correa is more favourable to him than what is mentioned during Vasco da Gama's viceroyalty. The Viceroy commanded the doctor of the hospital not to take in any sick person unless he were afflicted with sores or wounds ; and as the sick men who arrived in the ships clamoured on account of this, and it was reported to him, he answered that he knew of a remedy with which they would at once become sound ; and he ordered it to be proclaimed that in three days from that time the shares would be paid of a rich ship which he had taken coming from Chaul,1 and which was coming from Mecca, in which one [S. 393] hundred thousand serafins had been found in gold, and two hundred thousand in merchandise and slaves. He appointed as factor and distributor of this Fernan Martins Avangelho, and Bastian Luiz, clerk of the seamen's list, who sold it all ; and the whole was divided into shares, so that nothing was wanting. All the people flocked to this payment, and many came out of the hospital, and he ordered that they should not take them in again, for he was well informed that they took men into the hospital out of friendship. He also forbade that anyone who was wounded in a brawl should be taken to the hospital, saying that they brawled on account of women, and for that reason were not to be cured in the hospital. He gave strict orders against the ships' crews coming on shore, and that they were to remain on board the ships, where they would receive their victuals. The auditor-general, João do Soyro, who had come with him, remained on guard over the ships at the bar. The Viceroy had it proclaimed that every man should go to Cochym to be enrolled, because all those who did not go thither should remain without pay : and he did this also in Chaul, where the people remained according to the list and roll which he gave out, and so he did in Goa. In order that the ships might not be detained, he did not consent to their disembarking anything in Groa, which caused great losses to the shipping-agents, and was the cause of his giving them later shipments gratis for Goa in the King's ships, because he attended very much to administering strict justice. When the Viceroy was at Belem, before setting sail, knowing how [S. 394] great inconveniences resulted from men bringing women in the ships, both on account of their souls and on account of plots and brawls, in order not to give rise to these evils, he ordered it to be proclaimed on shore, and on board the ships, and his orders were posted at the foot of the masts, that any woman who should be found in the ships outside of Belem, should be publicly scourged, even though she were a married woman, and her husband should be sent back to Portugal loaded with fetters ; and should she be a slave and a captive she should be confiscated2 for the ransom of captives : and the captain who should find a woman in his ship and not give her up should for that lose his commission.3 He ordered the auditor to draw up an act of these proclamations : and when the ships reached Mozambique, three women were denounced to him, and he ordered them to be taken up, and here in Goa he ordered them to be scourged, all three together, with the proclamation by the crier of—"The justice of the King our sovereign ! it orders these women to be flogged, because they had no fear of his justice, and crossed over to India in spite of his prohibition." 1 Barros mentions the capture of a Moorish ship, probably the same, before Gama reached Chaul. It was bound from the Red Sea to Cambay, and was boarded first by D. Jorge de Meneses. Gama, after hearing from its captain, master, and pilot what goods they carried, put on board of her Tristão d'Ataide, his brother-in-law, and Fernão Martins Evangelho, and when taken to Chaul the goods on board were valued at sixty thousand cruzados. Castanheda says the money taken amounted to sixty thousand cruzados, and the merchandise two hundred thousand more. All the gentlemen, and the bishop, and the friars, and the brothers of mercy interceded on behalf of these women, and good men offered three thousand pardaos for the ransom of captives, which the Viceroy would not listen to at all. On the next daz, when they were to be brought out to be flogged, the brothers of mercy and the Franciscan friars came with a crucifix to beg for the women to be given up to them. This being told to Vasca da Gama, he sent them word to take back the crucifix at once to the altar, and then he would listen to them. This they did. Then he spoke to them, and told them not to let such a thing happen to them again, because to come to his house with a crucifix, through the streets where there were so many people, was a kind of [S. 395] conspiracy, and done to show the people that he was cruel and pitiless, and that they should not do this to him again. They entreated him earnestly to pardon,1 because if he did not carry out the execution of these women who had contemned his justice, men would act much better, confiding in that he would pardon their evil doings. This he would not do for anything in the world, and of this he took his oath, and promised that he would execute strict justice, without any pardon, on those who fell into his hands ; and this he notified to all persons who might do evil in his time, that they should suffer his strict chastisement, without his diminishing or pardoning anything ; for as to the man who did evil, he would take all his property, and he would give it as a reward to whoever delivered him into his hands, and he would order them to be slain inside the Balagate ; and it might very well happen that he would pardon some people for things which they had already done, but for those things which they did in his time they would find no remedy in him, but only the punishment of strict justice. So he commanded that the women should be flogged,2 saying, that he would punish with rigorous justice in this world, and that the Lord would have mercy in the next on whomsoever was deserving of it ; and that on account of the intention with which he was acting, God would give him his recompense according to his intention, for he would punish the bad with all his power, in order that the evils wrought by those who did not fear God should not increase ; for, he said, ''never shall they meet with anything from me except all severity and punishment." The people were much scandalised at what happened to these women, and judged [S. 396] the Viceroy to be a cruel man ; but seeing such great firmness in carrying out his will, they felt great fear, and were wary, and reformed many evils which existed in India, especially among the gentlemen who were very dissolute and evil-doers. 1 The text here appears to be incorrect. 2 Vasco da Gama sent them dowers from his death-bed. See further on. San Roman mentions the flogging of two women with two hundred stripes, according to the proclamation published in Lisbon against their coming in the fleet on account of the many crimes committed in consequence. The Viceroy was very zealous for the King's revenue, and used to say that men came to India very poor and enriched themselves ; and that he, if he could, would make the King rich, as the greatest benefit the people could obtain was to have their King well supplied. He was very ill disposed towards those of the King's officers who were rich ; and those who arrived with appointments from the King, before giving them their charges, he used to question and examine them, and if they did not give a good account of themselves, and shew themselves well fitted for the discharge of their offices, he did not commit them to them ; and if it was an office of clerk, he used to bid the person write in his presence, and if he was not a good writer he did not give it to him, and would say that if a man wrote badly and begged for a clerkship, it was only for the purpose of evildoing. He did not give appointments except to very official people,1 and said that he would not give appointments in the King's revenue as a reward for services rendered, because if afterwards he should detect them in robberies he should not bring them to justice ; and that men's services should be repaid with favours and honours, and not with appointments in which they could gain money ; and for this purpose he had authority to grant pensions, and increase of allowances, and honours, such as each might deserve. He commanded it to be proclaimed that any person in insurrection or who had fled from justice, that was going about India before his arrival, would be pardoned by him on behalf of justice for what he had done, if he returned to the service of God and the King within three months ; and if not they would never [S. 397] be pardoned, in the same manner as those should never be pardoned who should commit evil after he had arrived in India. 1 A homens muyto officiaes. He ordered it to be proclaimed that, under pain of death and loss of property, no one should navigate without his license, and that those who owned ships should make contracts and shipments with the King's factors, with the papers that should be requisite, and that without this they should not navigate ; and that any man who traded with the property of an officer of the King, whether an officer of justice or of exchequer, should lose his ship and all his property to the King, and should be banished for ever to Portugal, without leave to return again to India; because the King had need of the trade of India, to gain thereby wherewith to pay the services of the men in India, and to oblige them to serve in the fleets. He ordered it to be proclaimed that he gave permission to any man to go back to the kingdom who did not wish to continue in India, and who did not owe anything to the King or to justice. He took away the pay and rations from the married men, who were not to receive them unless there was a war in which they fought, or unless they went aboard the fleets. He had an inquiry made into the peculations and robberies which the officers had committed in the revenue of the mainland, and ordered them all to be arrested, and strict accounts to be taken from them. He had it proclaimed that no seafaring man should wear a cloak except on a Sunday or Saint's day on going to church, and if they did, that it should be taken away by the constables, and they should be put at the pump-break for a day in disgrace ; and that every man who drew pay as a matchlock man should wear his match fastened to his arm. He upbraided the men-at-arms very much for wearing cloaks, because with them they did not look like soldiers. He ordered that the slaves they might have should be men who could assist in any labour, for they were not going to be [S. 398] allowed to embark pages dressed out like dolls on board the King's ships, and grown-up slaves going in the fleet would be supplied with the King's rations. He ordered it to be proclaimed, under pain of death and confiscation, that any person who had got any of the King's artillery should send and deliver it to the magazine, without any penalty, even though he might have stolen it anywhere, and this within the space of one month, after which they would incur the penalty. In this manner much artillery was gathered in, which was in the possession of trading merchants, through agreements with King's officers, who used to deliver it up, the King remaining a loser of the powder and balls which they sold. The Viceroy thus gave instructions for many matters which he placed on a good footing ; and he embarked for Cochym in a new galliot,1 which he found completed. He embarked with few servants, who were not gentlemen, for he always rid himself of those, and preferred the lascars, who conducted themselves after the manner of good soldiers. He was accompanied by six fustas, with which he went along the shore, and the ships out at sea, and he used to go up the rivers and see how they were, so as to learn everything. He left orders with Dom Anrique that if the governor arrived there he was not to allow him to land, nor obey him [S. 309] in anything. As the Viceroy went thus running down the coast, he learned that the paraos of Calecut had factors in the rivers of Mangalor and Bacanor, who sold the plunder which they took, and gave them cargo of rice, which they carried to Calecut. He ordered the bars of these rivers to be taken possession of, and placed there Jeronymo de Sousa and Manuel de Macedo, with vessels for that purpose ;2 for the paraos which cruised outside, knowing that the Viceroy had arrived at Goa, had all taken shelter in Calecut, He arrived at Cananor, where they gave him his reception, and he had an interview with the King, with pomp and honours. The King was much pleased to see him, on account of the things which had been related of him with respect to the discovery of India, and the injuries which he had since done to Calecut ; and he gave him a rich jewelled neck-chain, and the Viceroy sent him a present of pieces of silk from the kingdom, and both established great friendship. He remained there three days, and put D. Simão de Meneses in the flagship, because D. João da Silveira had finished his time ; and he departed, and passed by Calecut at night, because he learned that it was in a state of commotion, but there was no fighting, and the people of the shore communicated with our men, and came to sell provisions at the gate of the fort, after they heard of the arrival of the Viceroy. 1 Barros says of the voyage to Cochym that it was full of affronts, which were so great for his state and condition that he made haste at Cochym to take measures respecting them. On the way he met Francisco de Mendonça with eight sail guarding the coast. The Moors took little account of him, for as they had swift vessels, and the Portuguese ships were large and heavy, they dealt with our vessels like a light horseman with a man-at-arms. For which reason they were so bold that they appeared before the Viceroy during the whole voyage in all directions showing that they took no heed of him ; so at last he sent his son D. Estevan with some others in boats to frighten them, and some paid for others. San Roman says the Moors showed on several occasions that they thought little of his coming, as it seemed to them that he knew more as a mariner than as a soldier. 2 Barros says he gave Jeronymo de Sousa six vessels, and that he destroyed more than forty paraos, which had been equipped at Coulete under a Moorish captain named Cutialla, by orders of the Zamorim, to cut off the provisions which the Portuguese carried from Cananor to their fort in Calecut. How the Viceroy came to Cochym [Kochi/കൊച്ചി],1 and what happened until D. Duarte arrived from Ormuz. 1 Castanheda says Gama arrived at Cochym at the end of October. [S. 400] When it was known in Cochym that the Viceroy was already near the town, the Doctor Pero Nunes, the overseer of the treasury, went out to sea in a large boat with an awning, and dressed out, to laud the Viceroy in it if he was so pleased. Since the sea-breeze was feeble, the Viceroy did not reach further than to Cranganor, where the overseer came up with him, and was received by him with great honour, because he had been much commended by the King ; for as long as he had held his office, which had been six years, he had done such good service, that he had sent pepper of such quality that in the kingdom it suffered a loss of1 seven or eight per cent, whilst at first it lost thirty or forty per cent, on account of being damp, green, and with a mixture of sand and grit, and the factors mixed it badly, by which they made their profit. This man remained all night with the Viceroy, to whom he gave a long account of the affairs of the governor and of all India. Dom Luis kept the galloon Sam Luis outside of the bar; he had refitted it this winter, and it was well equipped with artillery of heavy calibre, and awnings and flags. He embarked in it next day with many gentlemen and plenty of food, and set sail in search of the Viceroy, who was standing well out to sea with the land-breeze, which was light for reaching Cochym. On reaching the poop of the Viceroy's ship, he ordered a salute to be made from the galloon's top by lowering and hoisting the standard of captain-major of [S. 401] the sea, which he carried. This was replied to with trumpets and kettledrums, because the Viceroy was now coming in the ship from Cananor to this place. Dom Luiz immediately got into a boat with his gentlemen and went to the ship, and the Viceroy received him at the ship's side with many embraces and welcomes, and Dom Luiz made great courtesies ; after which, they sat down on chairs upon the quarterdeck, where the Viceroy received the gentlemen who came with D. Luis to make their salutations. The Viceroy dismissed the overseer of the revenue, who went on shore. He had given the Viceroy a long account of the goodness of Dom Luiz, and especially of the manner in which he had reproved the governor for his faults, so that they were not on good terms together : of which the King in Portugal was already well informed, on which account he had charged the Viceroy to shew D. Luis great honour. Dom Luis remained with the Viceroy talking of pressing matters and of the voyage, until the sea-breeze came, when they made for Cochym, and they reached the bar at Ave Maria (after sunset). The ship of Vicente Gil was at the bar. He, as a merchant, to make his profits, had parted company at sea in the night, and made his course for Cochym, where he sold his merchandise and made much profit, which he would not have done had he gone to Goa. This the Viceroy was well aware of, and paid him off well for it, because he had strictly forbidden all the captains separating from him. On arriving at the anchorage, Dom Luis took leave, and returned to his galloon, which was a long way off from the anchorage of the ships. The Viceroy's ship made a salute with much artillery, after which all the fleet fired salutes, and last of all the caravels : a wonderful sight to see, for as the night was already dark, all the fleet could be seen by the glare of the artillery fire ; but a shot from one of the caravels, from want of care, struck another, and killed two [S. 402] men in it. When all had done firing', then Dom Luis gave orders for firing all the heavy guns which had balls, which were thirty-two large pieces, and besides falconnets, swivel-guns, and chambers,1 so that he fired more than a hundred shots, and surpassed them all ; and the Viceroy was much pleased at seeing so well armed a galloon. The Viceroy slept in his ship, where next day the King sent to visit him by one of his ministers ; and Dom Luis went on shore to arrange with the officials of the Chamber for his reception ; and everything was got ready for the next day, when D. Luis went to disembark the Viceroy, for which purpose he took a new galley which he had built, and which was manned from the prow abaft with slaves belonging to the King, who were good rowers. The poop was dressed out with rich cloths, and contained the gentlemen, and a great banquet for breakfasting or dining, if the Viceroy pleased. With him there came D. Diogo de Lima, the captain of the fortress, which fired a great salute on his reaching the ship, when he went to the Viceroy, who received them with great courtesy. On D. Luis saying that he had come to convey him on shore, the Viceroy made him many excuses, and said that he would not go except in his own boat, which was already prepared for that, with an awning of scarlet cloth striped with dark velvet, braided with gold thread and black thread, and a fringe of gold and scarlet, and lined inside with satin brocade, and at the stern the royal standard of white damask, and the cross of Christ on each side, made of crimson satin, braided with gold thread and tassels. His guard went in two boats with its captain, dressed in livery, with pikes gilt half way; and in another boat the auditor-general, with his constable and men with their staves of justice and lances. All the captains came in their boats, with their people very richly dressed. When the Viceroy entered his boat, he sat down [S. 403] on a chair, and [made] D. Luis [sit] close to him on another : at which D. Luis made great compliments of courtesy, and excused himself from taking the chair ; but the Viceroy made him sit down, and said : "Sir, let your worship sit down, for you deserve other greater honour, and you have gained it in the estimation of the King my sovereign, through your good deserts of honourable deeds and good understanding ; for you have obtained more than the governor, your brother, who in India has injured his great honour, which he won with so many labours in Africa : all which has increased in you through your goodness, for which His Highness will give you great recompense." Since the Viceroy said this to him in public, Dom Luis replied to him with his barret-cap in his hand : "Sir, I kiss your lordship's hands for so much honour, but if I have any goodness, the favours which His Highness shewed to me have given it me : but if he is dissatisfied with the governor my brother, I can feel no pleasure which can ward off that great grief, which is the greatest which I can feel in this world, because I shall not be able to remain without some portion of blame." The Viceroy answered him : "On the contrary, it the more redounds to your honour." So they went on conversing very sweet words until they arrived at the strand, where they landed in front of the church, where the Viceroy was received by the aldermen (vereadores) with a rich canopy, and a harangue of great praise ; and with the clergy in procession and the uplifted cross, they went to the church to prayer. They told him that the King of Cochim was coming, and when the prayers were ended, the Viceroy came to the door of the church, until the King approached, when the Viceroy came out to receive him in the straight street,1 and the King on seeing him, dismounted from the elephant on which he came, and embraced the Viceroy [S. 404] several times, and the Viceroy made great salutations of courtesy to him, and they went to sit in the doorway of the church, which had a largo porch, where they spoke words befitting a visit ; after which the King took leave, and returned upon his elephant. The Viceroy went to lodge in the fortress, at the gate of which, he dismissed Dom Luis with his salutations. There Dom Luis always visited him, and always accompanied him to the church, and returned to his own house, because the Viceroy occupied himself with the dispatch of business, which gave him much occupation, without his taking repose or mid-day sleep, neither did he close his doors ;2 and in the mornings and evenings he used to visit the strand and the warehouses, to hurry on the unlading of the ships. The Viceroy commanded Vicente Gil to be put into prison because he had come to Cochym before him, and he ordered the master and pilot to pay each of them a hundred cruzados, and Vicente Gil three hundred, which he sent to the superintendent of mercy for the expenses of the hospital. 1 O sayo a receber á Rua direita : or, in the street on the right hand side. 2 The text has sem ter repouso, nem sesta, nem porteiro, nor a porter : that is to say, he was always accessible. The Viceroy, in running down the coast, had left a guard in the rivers of Mangalor and Bacanor, and had sent Diogo Martins de Lcmos in a galliot to seize upon the river of Mangieirão, beyond the mountain Dely, because he knew that the paraos had there also a landing-place for taking in provisions. He also had four fustas, besides those which had been taken in Dabul, which D. Anrique had sent to him from Goa.1 The Viceroy entertained serious thoughts of carrying on a great war in all the coast and rivers of the [S. 405] Indian shores, as soon as he should have finished dispatching the ships to the kingdom. So he ordered four new caturs which had been built in the river of the Culymutis to be taken and brought to Cochym. These had been made of very sharp build, to row well, and every one praised them much, and he ordered them to be burned, saying that he would shew the Moors that we could build better caturs than theirs. After that he summoned Master Vyne, a Genoese, whom he had brought to build galleys, and he asked him if he could build vessels which would row faster than the paraos of the Malabars. He replied : "Sir, I will build you brigantines which would catch a mosquito for you." He at once set himself about this work, and made two brigantines after the Levantine fashion, which were finished in twenty days. The Viceroy then caused it to be proclaimed that to every Portuguese man who would row in the brigantine, sitting on the bench, he would pay him monthly his wages and provisions, and would give them freely all the goods above deck of all the ships they might overhaul by rowing ; and besides they should have double shares of all the prizes along with the other people, and he would make them free of all other service in summer and winter, so that they should have no work except with their brigantine. Upon which so many mariners and ship-boys offered themselves, that there was a superabundance. Each of these rowers had under his bench a breast-plate and helmet of steel, and a lance and shield, and two pots of powder ; because, on seeing the prize, they armed themselves, and put on the helmets, which glittered afar off, and on coming up with the prize they let go the oars, and took their spears and bucklers and powder-pots, which they cast on coming alongside, and there remained thirty armed men, who fought and could do much ; so nothing escaped them either with oars, or sail, or fighting. 1 Barros also mentions amongst the acts of the Viceroy at Cochym, his sending Simon Sodré with four sail to the Maldive Islands against some Moors who intercepted supplies for the fleet, chiefly coir rope. Barros also says that the Viceroy prepared a fleet to go to the Red Sea under his son Estevan, but he did not go since his father fell ill in the midst of these preparations. The Viceroy showed himself very well disposed to warlike [S. 406] men, amd used to say that when he went to fight, he would not give the captaincies except to men who in war had shewn themselves as good soldiers ; for he would give the honours of war to those who had won them with their right arms, and however low a man he might be, he would shew him more honour than to a gentleman Jew. This he used to say of many in public, for the Viceroy was very haughty in his speech ; and he said that, whoever was not satisfied with that, he would give them leave to return to Portugal to eat what their fathers earned. He inspired everybody with great fear, especially the captains of the forts; for if he found them in fault he would chastise and execute them, and if they remained alive he would send them to the King, with the charges against them ; because if they were bad, so also would be the officers of their fortress, and the officers of justice and the revenue, and then all together destroyed the people; because the injuries committed by the Moors sprang from the robberies which the captains committed upon them ; and therefore no one should go to Portugal to escape from the evil which he had done in India during his time, because as he would chastise the great, the small men would be afraid. Therefore, whenever he found a man aggrieved or injured by the great, or by sentences wrongly given, he would redress it all, and chastise with strict justice ; and he had no need of the gentlemen for fighting, but only for props, to set up one when another was rotten. And if any gentleman gave favour or shelter to any malefactor who took refuge in his house, and did not at once give him up to justice, he would send him in irons to the King, saying that he was a harbourer of malefactors ; and if if any one gave to a malefactor the means of escape, the punishment which the malefactor would have undergone should be inflicted upon him. He ordered it to be proclaimed that in the case of officials of justice or revenue committing faults, he would change the civil penalties for [S. 407] them into criminal chastisements. Thus in everything he showed himself a strict minister of the service of the King and the good of the people, for the service of God and the good of India. He put into the captaincy of Cochym, Lopo Vaz de Sampayo, who came with that appointment ; and as D. Diogo de Lima had finished his term of service, and because he was poor, the Viceroy gave him a ship in which to go to Ormuz to make his profits ; for the captains of Cochym and Goa, being under the eye of the governors, are not able to make such gains as the captains of the other fortresses, which are more removed from the information of the governors. The Viceroy caused the ships to be laden with much expedition, and sent to Ceylon for cinnamon the two ships belonging to the warehouse, which the overseer of the treasury had bought for fetching cargo, as I before related, and which were well equipped and armed, and had masters and pilots, and did good service to the King. The Viceroy sent Duarte de Mello in one of these ships to be captain of Ceylon, and orders for the return of Fernan Gomes de Lemos, concerning whom he had received bad information, and whose time of service also was completed ; and he prohibited them, under pain of death, from touching at any coast besides Cochym after leaving Ceylon. The governor (D. Duarte de Meneses) made great profits in Ormuz upon the goods which he brought, because the brokers delivered them to the merchants at high prices, and made the payment of them obligatory, and there were other gifts and bribes, which the Resxarafo (Reis ul Sharafa) took from the people to give to the governor, to keep him in good humour. Whilst he was thus at Ormuz, there arrived there one Joan Gonzalves with letters from Dom Rodrigo, who was in the lands of the Prester, by which he urgently requested the governor to send him a vessel, because persons, who were Dom Luis and Heytor da Silveira, had come to the port of Masowah, and had not brought them away, because they were at some distance from the sea by order of the Prester, in order to be in greater security ; on which account, on hearing a message from the [S. 409] vessels, and travelling with much expedition, they were not able to arrive at the port within the time for which they had been summoned : the captains, therefore, had gone away without waiting for them, and the cause of this was that the vessels had arrived late at the port, when they could no longer wait for them. So that the two vessels went there for nothing, and caused great expense to the King. In order that this might not happen again, and they remain forgotten on account of other business that there might be in India, they all besought him, for the love of God, to remember them, and when he sent a vessel, that it might be with instructions not to delay on the way, and to arrive at Masowah in March, or as much sooner as was possible. Dom Rodrigo sent Joan Gonzalves with this letter because he knew many languages ; and in the dress of a Moor, and in the company of merchants with their merchandise, he embarked in a Moorish ship, which was cast away on the coast of Fartaque in Badalcuria. He escaped from the wreck, and begging alms along with the other Moors who had been wrecked, he went as far as Maskat, and thence to Ormuz. The governor bestowed favours on him for his labours and hardships. He related to the governor all that had passed between Dom Rodrigo and the Prester. This I do not write here, because I will do it farther on, after D. Rodrigo's arrival ; for there were some of his people who wrote it down, especially the Father Francisco Alvares, who took most care in writing in minute detail all that happened, from whom I had his book, from which I took the chief parts which seemed to me necessary for this history, and I did not take many minute details, because the reading was long, and later it was printed in the kingdom, and came printed to India. 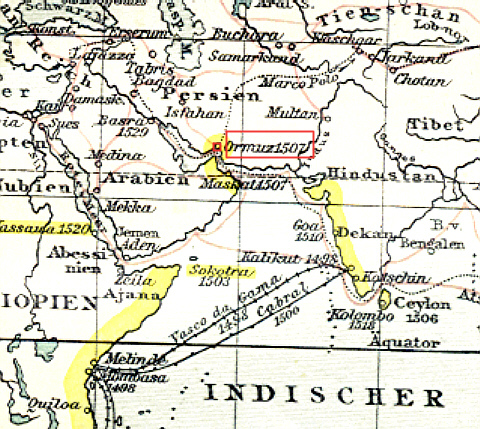 The governor, having finished collecting his goods and taken the measures that were requisite, departed from Ormuz and came to Maskat, and from thence sailed for India, making for the land above Dio, where he spread out the fleet, and waited some days for the ships from Mekkah, but none came. He then continued his voyage, passing by Dio at night, and went to Chaul, where he found Christovão de Sousa as captain, who at once sent out to meet him with refreshments, and a message that he would serve him in whatever he might command him as Dom Duarte, but in nothing as governor, for the Viceroy had given these orders ; also that he was not to come on shore, but was to go to the Viceroy. Upon which Dom Duarte took in what he wanted, and departed, and went to Goa, where the captain, D. Anrique, sent him a similar message. Hector da Silveira went on shore to see D. Anrique, who begged him not to allow any of his crews to land, and to conduct them all to Cochym, for those were the orders the Viceroy had left. Dom Duarte remained at the bar six days doing his business ; then he departed, and went to Baticala, where he remained at his leisure, buying goods for his chests for the kingdom, and articles for the voyage. Hector da Silveira, seeing that the governor would make many delays, so as not to arrive at Cochym except at a time when the ships would be already laden, so as at once to embark and depart for the kingdom, and that he said that he was not going to enter into disputes with the Viceroy, such as he would set on foot with him, since the Viceroy had come [S. 411] out so sour [verde] that he had taken the governorship of India before he had given it up to him—Hector da Silveira, seeing this, asked his leave to go to Cochym. This the governor did not wish to grant to him ; but Hector da Silveira repeated his request, saying that it was not reasonable that he should go on arranging his affairs very leisurely, whilst he had with him so many ships and crews, and was expending the King's stores. Upon this they debated. However, D. Duarte gave him permission to go, and dismissed the fleet for him to take it with him, retaining for himself five galleys with few seamen. Hector da Silveira arrived at Cochym with the whole fleet, and entered into the river with it. Making a great salute of artillery, he went on shore, accompanied by all his people and captains, and went to the church to offer up his prayers ; he then went to the Viceroy in the fortress, who received him with much honour. He crave the Viceroy a long account of his voyage and of the peace with Aden ; and the Viceroy replied that he had done well in all, except that he made a great mistake in leaving the brigantine and the Portuguese,1 because the King of Aden was to be trusted with them for the crown of two thousand xafarins which he had given, by which means he had deceived him, since the King of Aden did not choose to be vassal even of the Grand Turk ; and that he understood that the peace which he had made was only to save the ships which were in the port ; and if Silveira had asked for ten thousand xafarins, he would have given them, and ten crowns of gold over and above ; and that in everything he, and the captains who had counselled him, had been deceived. Upon which Hector da Silveira took to other subjects of conversation, because he saw that the Viceroy was cross with respect to a matter in which he thought that he had acted with much sagacity, and he was much afraid that the Viceroy would be still [S. 412] more angry with him when he learned that he had acted without the advice of his captains ; and he found himself much embarrassed, and said nothing about it to anybody, but always accompanied the Viceroy a great deal, for he never went out of his house without finding Silveira at the door, accompanied by many people, for he kept a large table, and so did Dom Luis, where all the men of India used to meet, for so large a number of people did not eat at the table of the Viceroy. 1 Silveira left a brigantine and twenty men for the revenue service of the King of Aden. The Viceroy was much occupied with the preparation of the cargo, and refitting the ships of the fleet and those which Hector da Silveira had brought, and with the preparation of a flotilla, for he had determined that as soon as he had dispatched the ships for the kingdom he would go and destroy Calecut and all the coast of India, so that there should not remain one Moor on land nor at sea; and with this design, and on account of other things which he found in India different from what he had expected, and on account of the affairs of Dom Duarte, he at once ordered a ship to be got ready to sail before the other ships with letters for the King, as soon as he saw Dom Duarte, who arrived at the bar of Cochym * *1 of November, and anchored at the bar in the galloon San Dinis, in which he came, with three other galloons, and other vessels which entered the river with the sea-breeze. 1 A note in the Lisbon edition says the day of the month is wanting in the original ; it seems that ten had been written and afterwards scratched out. Dom Duarte having arrived thus, the Viceroy sent Lopo Vaz de Sampayo, captain of Cochym, and with him Pero Barreto, whom he had made auditor-general, because João do Soyro was ill, and sent word to Dom Duarte not to come ashore, and at once to go over to the ship Castello, which was beginning to take in cargo, because he had to go to the kingdom a prisoner upon his parole that he would not [S. 413] go out of it except in Lisbon, upon a message from the King, and that he was to go and put himself on board the ship, and in it give this pledge signed by himself; and the Viceroy sent him a copy of a section of his instructions which said this.1 [S. 414] These men went to the galloon, and Lopo Vaz gave the message to Dom Duarte, at which he shewed himself much [S. 415] affronted and said to Lopo Vaz: "You ought not to be the bearer of this message, since that staff of justice, whom it seems you have brought to execute me, was sufficient and the fitting person for it : you ought to remember that my father made you a knight, and that you cannot therefore be against his affairs." Lopo Vaz replied that in doing what the King our sovereign commanded he would act against his own father, whoso head he would cut off if it was commanded him, and that apart from the King's commands he would act as his honour required of him ; therefore he entreated him to answer and obey what the King our sovereign commanded, and what he said to him on the King's behalf. To this Dom Duarte replied that he obeyed in everything, only that with regard to the vessel that was assigned to him, he had instructions in a contrary sense, which said that when he departed for the kingdom, he might select for his embarkation the ship which he pleased out of as many as there might be; and he said that as the King had not abrogated this instruction, the Viceroy ought to observe it, and not aggravate it, and that in the ship in which he embarked he would give the pledge which the King ordered. With this he dismissed them, and they returned on shore to give the message to the Viceroy ; and D. Duarte got into a boat and went to look at all the ships which were taking in cargo, and was satisfied with the ship San Jorge, in which he at once remained, and sent to the [S. 416] galloon for his baggage, and took up his quarters in that ship. 1 Barros says nothing of the disputes which took place between Gama and D. Duarte de Meneses, and only alludes to them in speaking of his illness, in addition to which, he says, Gama suffered from the "vexation which he felt on account of some matters of administration, and the delivery of the government by D. Duarte." Barros, however, describes Gama, who had begun to get ill before the arrival of D. Duarte, as drawing up a deed which was sworn to and signed by Affonso Mexia, the overseer of the revenue, and other persons: by this act Lopo Vaz de Sampayo was to serve as governor, in case of Gama's decease, until the arrival of the person named by the King for the succession. Barros adds that all this was done before D. Duarte had arrived from Ormuz to deliver up the governorship, which caused some gentlemen to have scruples with regard to this proceeding without the government being handed over as was customary. In justification of the course adopted by Gama, and his assumption of the government without waiting for its being handed over to him by D. Duarte, Barros gives the document of King John appointing Gama as Viceroy, dated Evora, February 25, 1524. This document, in the name of the King, makes known to D. Duarte de Meneses, the captain-major and governor of India, that, as he had been informed by another letter, the King was pleased that he should return to the kingdom with this fleet, and deliver up the government to D. Vasco da Gama, the Viceroy : and he was not any longer to make use of the governorship nor affairs of justice and revenue, nor any other quality pertaining to that office. Therefore, the said Viceroy was at once to be put in possession of all power, etc., etc. Further we declare that during the time that you may be in India before embarking, you may remain in Cochim or in Cananor, whichever you please, and with respect to your servants, etc., etc., who went with you, and those of D. Luis your brother, etc., etc., the said Count (Vasco da Gama) shall not have jurisdiction, etc., etc., over them. Reserving, however, that if you or the others should be assigned, or cited, or sued, either in civil or criminal cases, by persons, also by either our natives or merchants of the country, etc., who should not be coming in the fleet in which you are to come, you or they may be sued before the said Count and auditor, who is to remain with him, and the suit shall not be before you, in order to fulfil justice. And if you should be out of India when the said Count arrives, in that case the Count shall at once use all power, jurisdiction, etc., etc., as he would do if he found you there and presented to you this letter for you to deliver up the government, etc. And if by impediment of sickness you, the said D. Duarte, cannot embark in this fleet, we are pleased that you and your servants, and your brother, etc., etc., should betake yourselves to the fortress of Cananor : and remain in it till your departure from India: and you shall use in it all the power, jurisdiction, etc., which you have as captain-major and governor of India, over them, and over the captain, alcaide, factor, and clerks, of the factory and fortress : and you shall hear and judge all their civil and criminal cases, without the said Count being able to use the power of Viceroy over the above-mentioned. And we order the captain, and alcaide, and factor, and clerks, etc., etc., of Cananor to obey you, etc. We are pleased that it should also be so understood in case you should be out of India in our service, and should return to it after the departure for these realms of the fleet which the Viceroy takes with him for bringing spices, and in which you are to return. Reserving, however, that the power, etc., which we give you over the aforesaid is not to be understood with respect to anything which touches our revenue and Indian trade ; because you are not to deal with that, which remains with the Viceroy, etc. And of the delivery of the government to the Viceroy, you will take a public instrument, in which will be declared the ships and artillery, etc., and the forts and artillery, etc., which you deliver to him, etc., for us to be able to see it ; and after this delivery you are freed from all obligation for the said government. Given in Evora. February 25. Bartholomeu Fernandez wrote it. Year 1524." Barros also gives the document by which D. Duarte de Meneses received a public acknowledgment of having delivered up the government. It is dated Cochym, December fourth, 1524, and witnessed by Lopo Vaz de Sampayo, Fernan Martins de Sousa, D. Pedro de Castellobraneo, Affonso Mexia, overseer of the revenue, Pero Mascarenhas, the Licentiate Joan do Souro, auditor general : Joan Nunes, public writer, wrote it by special order of the Viceroy, and signed it with his public signature. Castanheda gives these two documents : he says D. Duarte called the auditor general a "bacharel." According to the document given by Barros, Gama appears to have acted with more harshness and less courtesy towards his predecessor than the King's orders warranted ; but he is somewhat justified by the statements of Correa, Castanheda, and San Roman, that D. Duarte de Meneses delayed giving up the government in the expectation that Gama would die, and that he would remain governor as before ; also that D. Luis tie Meneses, whilst appearing to occupy himself with preparations for his brother's journey, was looking out for an opportunity to place the government in the hands of his brother ; and that by the enforced embarcation of D. Luiz, the rumours which began to spread were suppressed. Senhor Basto, the keeper of the Archives of the Torre do Tombo, has informed me that these two documents given by Barros are not to be found in those Archives. The recognition by Vasco da Gama of the delivery of the government, etc., by D. Duarte de Meneses, would be kept by him, though a copy might be preserved in the Archives of India. Lopo Yaz gave the answer of D. Duarte to the Viceroy, at which he was much enraged, and as it was already late, he waited till next day to give orders for what was to be done ; but as later it was told him that D. Duarte had gone and established himself with his baggage in the San Jorge, at this he lost his patience, and at once next day in the morning he sent the auditor to tell D. Duarte not to get himself into more trouble than what he was in already, that the instruction with regard to his embarkation would be good if he had been at liberty, but that since he was going under arrest, he was not to go except in the ship Castello, which he assigned to him as a prison, and in no other ship ; therefore he was at once to go and put himself on board that ship, and there give the pledge, and if he did not obey the King's commands, he would then take such measures as he thought fit. To this Dom Duarte sent an answer that he might do as he pleased, and since he intended to use absolute power, he was well able to do so, for he had the knife and the cheese. The Viceroy, on hearing this answer, was much irritated, and said : "Dom Duarte has bad advice in the course he is following with me, and is placing himself in a position in which his misfortunes may become greater ; for even though I were unreasonable, he would be acting with sagacity in obeying; and since he wishes to follow out his fancy, he will hear of me." He then at once sent orders to the superintendent of the building yard to get ready two galloons, which were without yardarms and almost stripped of their rigging, which at night were equipped with artillery and gunners, and which had to go out of the river next morning, as they did go out; and in them the Viceroy sent the chief constable and the auditor-general, and he ordered them to anchor on both sides of the ship near the stern, and the auditor accompanied [S. 417] by two notaries, was to go in a boat alongside the ship, and from outside of it was to require Dom Duarte on the part of the King to come out at once, and go and place himself on board the ship Castello ; and if he did not obey that, the notary was to draw up an act with a protest signed by witnesses ; and he was then to repeat the requisition to him three times, and if he did not obey they were to shout to the ship's crew to come out, because they were going to sink it, and then having done this, they were to return to the galloons, and with the artillery send the ship to the bottom. He administered an oath to the auditor and chief constable to carry this out, and gave them his warrant for it. 1 O lume, literally, the fire. what the King commands, all will go well, because what I command is commanded by the King, and if he gives me some good answer on his behalf, perhaps I will do what is more for his interests, than what he could do for himself: and I tell you the truth, not in order that you should thank me for it, that for affection for you I am going much beyond what the King has ordered me, and I would show it you if I could." To this Dom Luis replied, but not with as much gentleness as the Viceroy desired: in the course of this they wrangled so much, that the Viceroy rose up and went to the door of the chamber, saying: "Senhor Dom Luis, go in peace, for I have already told you for my part many truths, and you little believe me, and think that you have all the reason on your side, and that I am the one who is mistaken ; by which you are unthankful for what I could do, and which I do not do because I see you stand in my way." Dom Luiz wished to speak, but the Viceroy took off his barret-cap, saying ; "Sir, do me the favour to let there be no more for to-day ;" and he turned his back upon him, at which Dom Luiz was enraged, and said : "You do not choose to hear me. I trust in God that a time will come in which I also shall not choose to hear you. I will go to my brother, and whatever happens to him shall happen to me." Dom Luis went down the hall as he said this, and many heard him, and he went to his abode, accompanied by many people who used to eat with him. These words which D. Luiz spoke were repeated to the Viceroy, at which he was greatly enraged, and ordered the captain of the fortress, Lopo Vaz de Sampayo, at once to order Dom Luiz to embark, and not to remain another moment on shore, and not to allow any one to go with him, and he (the Viceroy) would remain at the window until he saw him put on board. Upon which Lopo Vaz de Sampayo went to the house of D. Luiz, who was sitting down to table to dine with the numerous persons who ate with him. He, [S. 419] seeing Lopo Vaz, waited to see what he would say, and he, from the door, without coming inside, said to him : "Senhor Dom Luiz, the lord Viceroy commands that you should go with me to embark at once, and he remains at the window waiting until you go on board." Dom Luiz with passion laughed, and said : "I am amazed that he did not send biliguins1 to carry me off: all that he commands shall be done." Then asking for his cloak, he said : "Gentlemen, if they do not let you dine, I have ordered the dinner to be taken away, that it may not be lost ; and do you remain with the peace of God, since they take us away from eating this farewell dinner ;'' and this he said with tears in his eyes. The gentlemen rose from the table to accompany him, which Lopo Yaz did not permit, and ordered on the part of the Viceroy that no one should leave the house. This they all obeyed. D. Luiz alone, with two servants, went to the beach and got into a vessel (tone) which he found, and he went off to the ships, saying to Lopo Vaz : "Sir, say to the Viceroy that this kingdom is his, and later it will belong to another." 1 Bailiffs: Biliguim or Belleguim is an inferior officer of justice. This word has been in the Portuguese language since ancient times. Dom Luiz, as he was very discreet, had never gone to see his brother since he had arrived, that the Viceroy might not think that the two took counsel together ; and on arriving at the ship he found the auditor at the ship's side delivering the Viceroy's message to his brother, and D. Luiz said to him : ''Sir auditor, in order that you may not cause the loss of this ship which belongs to the King, wait, and I will deliver him up to you bound in irons, if you command it, and I will do everything to serve the lord Viceroy." He then entered the ship, and at the side the two embraced with many tears, D. Luiz saying to him : "My brother, I entreat you as a favour to submit to this turn of fortune, since such is so certain amidst the pleasures of this life ; [S. 420] and at once let us go to the ship Castello, and this excommunication will not touch you, which the auditor is publishing against you, for the Viceroy is going beyond all bounds." Dom Duarte was a man not inclined to anger, and he answered him : "My brother, I feel more grief at your irritation than at the thunders of the Viceroy. Let us go to Portugal, and if God takes us there, what He pleases will happen." Upon which they went to the ship Castello, and D, Duarte said to the auditor : "Go in peace, and say to him who sent you here, that his will is done, and shall be done in this country, which is now his empire." The next day the Viceroy sent Afonso Mexia, the overseer of the treasury, to Dom Duarte, with a minute requiring him to deliver up so many thousand pardaos belonging to the King, which he had received in such a place, and so many others in such another, and in such other, which made a great sum. D. Duarte replied to this, saying that the King had given him this factory in which he had received those so many thousand pardaos, and that he would go and give an account of them to His Highness. D. Duarte was afraid that the Viceroy would make some search in order to take away his money ; on which account, as soon as he had arrived, he had put it in security, for it was a small sum, as the greater part he held in precious stones, in a casket full of rich gold stuffs, pearls, and jewellery, which were worth a large price. The whole was put inside a chest, and he secretly entrusted it to Bastião Pires, the vicar-general, who was his great friend and in his secrets ; and along with him an old tutor, who had brought him up, who went at night in a boat of black Malabar men, and landed on the beach outside of the town ; and the boat went away, and they two took the chest, and with an iron shovel, which they brought for the purpose, they made a hole in the sand, into which they put the chest, and on the top of the sand they placed a skull of an ox, and they took [S. 421] the bearings by the monastery of Saint Antony, but not very exactly, as it was night, and they went away to sleep without anyone having seen them. The next day, after vespers, the vicar went for a walk on the beach, and saw very well where the skull was, for there was no other on the beach, and he took the bearings exactly with the wall of the monastery ; and walking there with other clergy to amuse themselves, he struck with a javelin against the wall, and the others flung it also, so that there remained good marks upon the wall, and the priest intended to come at night with a spit, with which he would probe and feel for it, and find the chest. It appears probable that some one who passed by kicked the skull, so as to change its position from where it was, for when the priest came at night and put in the spit where the skull was, he did not find the chest ; and he passed a great part of the night searching with the spit in all directions ; and as neither he nor the tutor, who also searched with a spit, could find it, they underwent much labour in seeking for it every night ; and the tutor, by daylight, walking about alone, searched with a javelin, which he stuck into the sand in all parts, taking the bearings of the monastery. After many days had passed, they fell in with it, when they were already despairing of finding it ; for God did not choose that so great a treasure should be lost. This I heard related by the vicar-general himself. The Viceroy prepared ships to cruise along the coast as a fleet, and as he did not find artillery in the magazines, he ordered proclamation to be made as in Goa, that any man who had any of the King's artillery should deliver it up freely to the magazine, under pain of death if he did not deliver it up, and it was found in his possession ; and if any man should have bought it, and had proofs of it, he would order it to be paid for, and his money returned to him. By this means a large quantity of artillery was collected, [S. 422] which the traders gave up, because they knew that their vessels would not be able to navigate, for there were many in Cochym which were drawn up on the beach, and rotted, and were lost, because D. Anrique do Meneses, who was governor after Dom Vasco, in this and in many things followed his own course, as I will relate further on. As information was given to the Viceroy that in the division of the prize ship, Fernan Martins Avangelho, the factor of the fleet, had gone shares with the factor and clerks of the factory in that matter, he ordered them all to be brought prisoners to Cochym, with good bail ; and he had very full inquiry made upon all the officials, saying that he would learn by what devices they enriched themselves ; and he went on examining diligently into other evils, so that without any doubt he put India into a very straight road for the good of the King's service, and for the good of the people, and, above all, very strict justice, which had become much perverted. For some days the Viceroy had been suffering from great pains in the neck, which had got awry, and some boils came to the surface at the nape of the neck, but very hard, and they would not ripen for all the remedies that were applied, for nothing availed, and they gave him such great torment that they did not allow him to turn his face in any direction. At this the Viceroy was subject to great fits of irritation, with the heavy cares which he felt on account of the many things which he had got to do, so that his illness was doubled, and went on getting worse until he altogether took to his bed, and from thence gave all the necessary orders, with great travail of spirit, which caused him to be overtaken by mortal illness, with such pains as deprived him of speech. In this affliction he sent Lopo Vaz the captain, and the Doctor Pero Nunes, and Afonso Mexia, and the auditor, with Vicente Pegado the secretary, to go to Dom Duarte with a deed of acknowledgment, made out by the secretary [S. 423] of how he had received India from him, and that he had delivered it up. These persons went to Dom Duarte and told him this; but he, who knew already in what state the Viceroy was, and was of opinion that if the Viceroy died he should remain in his government, as it was in his possession and no one had taken him out of it, with these thoughts replied that it was not the custom for governors to deliver up their governorship and accounts at sea, as he was, but, on the contrary, at the gate of the fortress ; that he was ready to go and deliver it up at once, but that he was not going to do it in any other manner. They sent word to the Viceroy of this message, and he replied by a letter which he sent to Doctor Pero Nunes, that he was to tell Dom Duarte that he was a prisoner, and would not leave that ship except by order of the King in Portugal, and therefore he was not going to come on shore ; and that they were to give him the acknowledgment of the delivery of India, if he chose to take it, because the Viceroy looked upon India as having been delivered up by him ; and although he should not deliver it up, yet not on that account would things turn out as he imagined, for this message would undeceive him, and his expectation would become vain ; after that the messengers were to return on shore, and they did return. The Viceroy commanded that a public act should be drawn up concerning all this by the secretary, in which all attested this which had passed between them and D. Duarte,1 and the Viceroy kept it. 1 Correa relates the voyage home of D. Duarte and of his brother D. Luis, who went in another ship, and kept great watch over D. Duarte, as he feared that he might go to Castile or to France ; on arriving at Mozambique, they obtained news by the ships from Portugal that D. Duarte's affairs were not in so bad a state as he feared ; they left Mozambique together, and passing the Cape D. Duarte said he would take in water at Saldanha, and that D. Luis should wait for him at the island of St. Helena. D. Luis went on, and it was supposed he was lost in a storm in which D. Duarte also was nearly wrecked. But in the year 1536 Diogo da Silveira captured a French pirate, the brother of a pirate who had taken D. Luis' ship, and he confessed that they had killed D. Luis and the crew of his ship, which was near foundering, and had plundered the ship and set fire to it with its crew. D. Diogo then cut off the hands of the pirate's crew and burned them in their ship ; for which afterwards the French pirates committed great cruelties on the Portuguese. D. Duarte made the coast of Algarve, and anchored at Farão, and buried his money safely ; he then would not go to Lisbon, but went to Cezimbra and landed with his goods, and ordered the ship to return to Lisbon ; but a storm came and drove the ship on shore with the cables broken, or, as some said, cut at night in order that it might be supposed D. Duarte's money was lost there. The King was much enraged at the loss of the ship, and D. Duarte was put in prison at Torres Vedras for many years. The King tried in vain to find his money at Farão, and at length, through the intercession of Count Castanheira, D. Duarte was set at liberty and restored to his captaincy of Tangiers : and they never found his money for which he had suffered so much. This Correa wrote from hearsay as related by those who came from the kingdom, and (he says) all may be lies, like all things in this world except to love the Lord God. Of the death of the Viceroy, and of what he did and ordered before his death, and how he was buried. [S. 424] The Viceroy, feeling that he was ill, spoke secretly at night to the guardian of St. Antony, who was his confessor, with whom he consulted ; and at this conjuncture there arrived at Cochym the ships and vessel from Ceylon with the cinnamon, which was transferred from them into the ships bound for the kingdom, which were now almost laden, and the Viceroy hurried this on. He despatched at once the vessel to the kingdom with his letters ; Francisco de Mendoça went as captain of it, and he sailed on the first of December. Fernan Gomes de Lemos, who had been captain there (in [S. 425] Ceylon), came in the cinnamon ship. The Viceroy had information of him that he was an evil liver, quarrelsome, and fond of divisions, reckless in doing evil. He had committed iniquities in Ceylon, and a man named Ganchinho by nickname had demanded justice of him from the Viceroy, for he had cut off his arm at the elbow, and he was maimed. So when the ship reached the bar he sent thither the auditor general to take from him a pledge signed to the effect that he would not leave the ship without his commands ; and if he would not give such a pledge, the auditor was to bring him as a prisoner, and shut him up in irons in the fortress, and collect the depositions which came from Ceylon : and this was done. 1 Probably this was the document stolen from the grandfather of the present Marquis of Niza. See Introduction. Having done this, he did not attend to anything else, but only confessed and took the holy sacrament, with much perfection as a Catholic Christian ; and he made his testament, by which he ordered his sons to return in those ships to the kingdom, and to take away all his goods, and sell nothing, and to take away all his servants ; and those who wished to remain, they were to pay them all their pay due from the King for the services which they had rendered ; and they were to give all his clothes and household furniture of silk to the churches and hospital ; and he sent to the women whom he had ordered to be flogged at Goa, a hundred thousand reis for each one, which were to be given them with much secrecy, and if they should not choose to accept them, this sum was to be doubled, and given to the house of Holy Mercy. These women, with this money, found good husbands, and were married, and became honest women. He set his affairs in order like a good Christian, with all the sacraments of the Church, and ordered that his bones should be conveyed to the kingdom, as they were conveyed later ;1 and speaking always with his full understanding, he fulfilled his days when he delivered up his soul in the night of Christmas of the holy birth of Christ, at three o'clock after midnight, on the twenty-fourth day of December of this present year of 1524.2 God be praised. 1 Vasco da Gamia's remains were removed to Portugal in 1538 (not 1528, as the Univers Pitioresque has it), and buried in his tomb in the town of Vidigueira, of which he was Count. 2 Castanheda, Barros, and San Roman agree in the date of Gama's death, eve of Christmas 1524. His death was kept silent, without weeping and lamentations, and the doors were closed all the day till the hour of Ave Maria, when everything was ready. Then his sons and servants gave the signal of his death with very great lamentations; upon which many gentlemen, his relations and [S. 427] friends, came in to assist them ; and soon after all the people of the city came together in the court of the church, and each one shewed what he felt. The body, dressed in silk clothes, and over them a mantle of the Order of Christ, with a sword and gilded belt, and gilt spurs fixed upon dark buskins, and on its head a dark round barret-cap, was placed in the hall, in the bier of the brotherhood of Mercy, uncovered ; and the gentlemen, clothed in the mantles of their order, bore it on their shoulders, with many tapers, and followed by all the people. It was carried to the monastery of St. Antony,1 and buried in the principal chapel ; and upon the tomb was a square grating surrounding the grave, of the height of a span, lined with black velvet, and a black and white fringe, placed upon a velvet cloth, which covered all the grave. There the next day a great service was performed, and all the gentlemen were present, and his sons were placed amongst the friars, and at night they betook themselves to the monastery and made their lamentations, as was reasonable on losing so honoured a father, and of such great desert in the kingdom of Portugal. For it pleased the Lord to give this man so strong a spirit, that without any human fear he passed through so many perils of death during the discovery of India, as is related in his history ; all for the love of the Lord, for the great increase of his Catholic faith, and for the great honour and glory and ennobling of Portugal, which God increased by His holy mercy to the state in which it now is ; and in order to have some merit from the Lord, for the salvation of the soul of the Viceroy, for the good desires with which he laboured in the affairs of the [S. 428] wonderful discovery of India, which it pleased the Lord should be done by him ; where now are dedicated to His holy praise so many monasteries and churches, and where there are so many new Christian communities of so many souls which have been turned to the true knowledge of the salvation by our holy faith, as we see at the present day, and every day will be with greater increase, by His holy goodness and mercy. 1 So also Kays Pedro Barreto de Resende; Barros and San Roman call it the monastery of St. Francis ; Castanheda says the cathedral of Cochym. An article of the Boletim do Governo, Goa, December 21, 1858, on the subject of Gama's tomb, says he was buried in the principal chapel of the church of the Franciscan monastery of Cochym. The sons of the Viceroy, Dom Estevan and Dom Paulo, collected together his servants, and fulfilled entirely their father's commands, and both went to the kingdom in the ship of a merchant, and were received with great honour by the King, who shewed much grief for the death of their father, for the great loss which he sustained by the death of of so good a vassal, from whom he hoped to receive such good services. 1 The cathedral in which Vasco da Gama was buried no longer exists : it was destroyed in the manner described in the following extract from the private journal of Mr. Chisholm Anstey, who visited Cochim, November 9, 1857. "The harbour of Cochim exceeds my expectation.... If it were not for the bar of shifting sand it would be one of the finest in the known world : as it is, even, it will be hard to match it in India. The deepest water is inside, just where the wonderful chain of inland navigation called the 'backwater' finds one of its outlets to the sea. By means of that chain Cochim has not only smooth and safe access to the Ghats eastward and to the Carnatic, but northward to the Goa territories, and southward through Travancore to Cape Comorin....I was agreeably surprised with the appearance of the town. It is not that the destruction was less complete than the Vandals of Leadenhall Street designed. On the contrary, it is hard to imagine a more faithful and exact performance of the will of a superior than was rendered here in 1806 by the Company's Proconsuls to their intelligent and honourable masters. The stupendous quays, shattered into enormous masses by the Company's mines of gunpowder, still encumber the anchorages, and make embarkation and disembarkation difficult. Not a vestige remains of most of the public buildings. The magnificent warehouses of the Dutch East India Company, which won admiration from the rest of the world, and envy from our own Company, were the first to be sprung into the air. There [S. 429] is a solitixry tower left—the 'Flagstaff' they call it now—to tell where stood the cathedral of Cochim, and where the body of Vasco da Gama was buried. His grave has been defiled by us, and its very place is now forgotten. 'You are within fifty yards of it, but on which side I cannot say'—was the only indication which a well-read and careful investigator of local antiquities—himself a resident here for some years past—could give me of the whereabouts of him who opened the Indian Ocean to our commerce—to all commerce. One church—diverted from the Portuguese to the Dutch worship, and from the latter to the English Protestant establishment—is the only one which the Company's Guy Fauxes were pleased to spare. That too is the only building left us whereby to justify our faith in the chronicles which record the ancient wealth and splendour of Cochim." 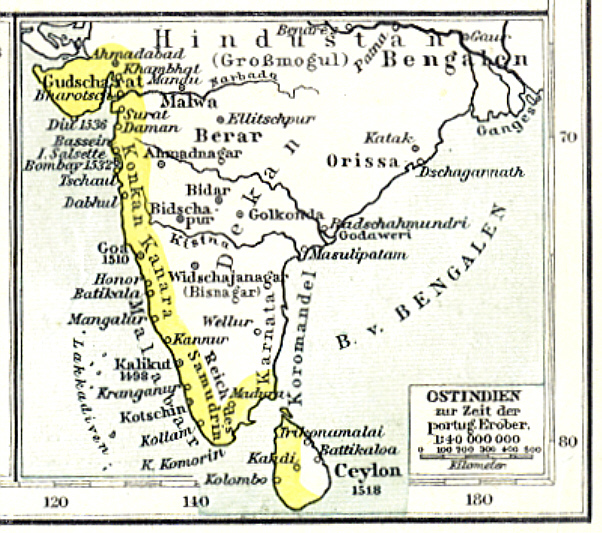 The journal then goes on to state that Cochim came into British hands in 1796, the British being the allies of the Stadtholder ; and in 1806 it was feared that the ministry of Charles James Fox might restore Cochim and other Dutch colonies to Holland, and so the only port south of Bombay where large ships could be built would be withdrawn from the East India Company. " So in that year the British authorities gave the word to blow up with gunpowder the fortifications, public buildings, etc., etc., and great was the Company of Guy Faux : great also the success. The Company's gazetteers are still able to record that not only war and trade and government were made impossible, but animal life itself. 'Scarcely a private house,' we are told, 'of any size or value remained standing :' all who could do so 'left the place;' 'all who could not,' it is coolly added, 'sunk into abject beggary, though some formerly possessed titles, and held high rank and station. '...Really it cheers one to think that there is a complaisance which can chronicle such things, and not be ashamed! Still, in its ruins it is inviting enough : were it not for the misery of the indigent, which its now renascent trade will in time extinguish. One can trace out the ruins for a mile square from the sea, even beneath the forest growth and herbage....Now that free trade and liberty of the press have wrested (1851), tardily enough, from Leadenhall Street the bare permission to those who will to go out and live at Cochim, and trade there if they can, there are signs of life even amongst these ruins.... In this wretched fishing village, for in 1851 it was no better, there are already now in 1857 seventeen thriving mercantile establishments ; amongst them all they exported last year from Cochim not less than £600,000 sterling worth of Cochim and Travancore produce....The Company has suffered the backwater navigation to fall into ruin. But all is of a piece with the policy which sprung the mines of 1806 upon the wharves and magazines of the same commerce. I could not help reflecting thus as to-day I saw the Persian, a ship of more than 700 tons, lying off one of the ruined quays to which .she was moored, and which, albeit in ruins, was [S. 430] still so useful that the cargo could be carried on board along a foot-plank without the need of a boat. And lastly, the Cochim policy of the Company is of a piece with their Carnatic policy. Where are the 52,000 stupendous tanks which once irrigated the then fertile but now famine-stricken Carnatic, so near a neighbour to this place ? All ruined, dry, choked up ! And it has become the necessary work of a small body of philanthropists to commence an agitation in England, to persuade or compel the Madras government not to deprive the people of the means of restoring those lost irrigation works, or replacing them upon as grand a scale from Cavery, Godavery, and other rivers now neglected, and alike useless to the carrier as to the husbandman." Thornton, McCuUoch, and the French Geog. Dict, of Guibert agree in stating that this destruction took place in 1806, but no trace of it is to be found in the India Office or Admiralty Indexes. Thornton's Gazetteer contains most information on the subject, and refers to Edye's Description of the Seaports of Malabar, a book which I have been unable to find. It is not surprising after the destruction above described that, two years later in 1808, when "it was reported that a French force would land on the coast of Malabar in the course of January, in anticipation of this event, the Dewan (or minister of the Raja of Cochim) urged the Raja of Cochim to prepare to unite himself with the Travancorians and French for the purpose of expelling the English from the country." Thornton, Hist, of India, vol. iv, p. 119. Zu: 3. Zum Beispiel: Jan Huygen van Linschoten <1563 - 1611>: Diary of occurrences in the Portuguese settlements in India, 1583-1588 A.D.